A match made in geeky Heaven. Hi everyone, I don’t normally write editorials on the site, but I wanted to share some fantastic news. As you may have noticed, we’ve been doing some sprucing up around here on the old blog with a new look, new gameroom showcases, and more frequent articles. 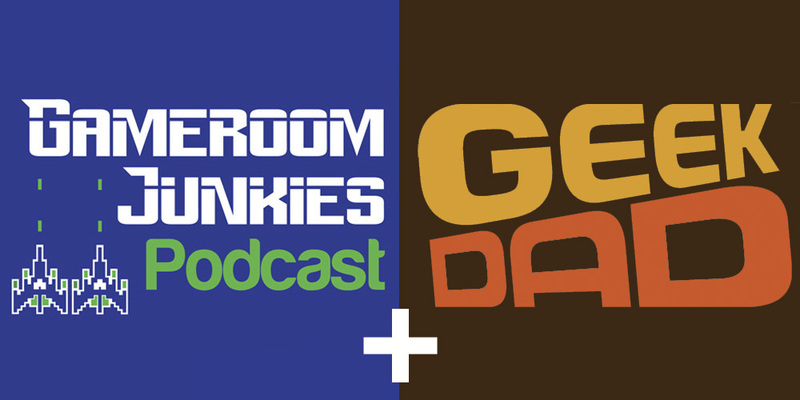 I’m happy to announce the reason for this is because we are the newest members of the GeekDad Podcast Network. If you’re not familiar, GeekDad is a long-running blog focused on geek culture and parenting and was formerly a part of Wired.com. I recently began writing for their website as an occasional contributor in February, and was thrilled to learn they would be kicking off a new podcast network. This is huge for us. The number of people GeekDad reaches on a monthly basis is staggering. We have a fantastic opportunity to reach a large new audience, and we want to rise to the occasion. Because of that larger audience, we want to be a little more inclusive. While we still plan on talking about our love for arcade and pinball machines, we’re expanding our scope to be a little bit more accessible to folks who may not know the ins and outs of our world but want to learn. Along with that, we want to strive to put a little more focus on family gaming and our role as dads in this crazy hobby. Don’t worry. If you’re a fan of the show, I’m confident you’ll still be a fan of our show. We’re not completely changing the way we do things, just doing what we do better. We’re releasing our 50th episode very shortly, and I think you’ll see that we stepped up the caliber of content. Honestly, we needed this. We realize that we were stagnant for a little while, we were really pinball-heavy, and our release schedule suffered. GeekDad has been a much-needed shot in the arm. Patrick and I are both re-energized to put out a great show. If you haven’t listened to the show in a while, check out episode 50 and give us another shot. If you’ve stuck with us through it all, thank you. This has always been a passion project for us. Now we look forward to sharing our passion with even more geeks. Thanks for the amazing ride so far! P.S. GeekDad just split from Condé Nast and has some hefty legal bills. If you like what we do and what they do, throw them what you can. Thanks!